Background: Successful management of spasticity in cerebral palsy (CP) has remained a therapeutic challenge. Botulinum toxin is a potent neuromuscular blocking agent with Type A being commonly used for treating focal spasticity in children with CP. However, its use in CP children is rare in the Indian literature. Research elsewhere has seldom focused on predicting optimal response regarding functional outcome. Objectives: The objective of the study is to study the efficacy of botulinum toxin Type A injection in CP with lower limb spasticity regarding reduction in spasticity, improvement in range of motion (ROM), and improvement in various gait parameters. Study Settings: The study was conducted in the Department of Physical Medicine and Rehabilitation in a tertiary care hospital in North India. Study Design: This was a prospective, interventional cohort study. Methods: Thirty-one children were enrolled in the study. They were evaluated just before injection and at 4 and 12 weeks after injection using Modified Ashworth Scale for gastrocnemius and hamstrings spasticity, Adductor Tone Rating Scale for adductor muscle spasticity and goniometry for ROM of the ankle and knee. Various gait parameters using footprint analysis were also done. Results: Statistically significant reduction was seen in spasticity of gastrocnemius, hamstrings, and hip adductors in the follow-ups at 4 and 12 weeks compared with preintervention (P < 0.05). There was a statistically significant increase in velocity, cadence, stride and step length, and statistically significant reduction in the toe drag in all follow-ups. Conclusion: Botulinum toxin Type A is effective in improving the various gait parameters investigated. In 2007, an international workshop on definition and classification of cerebral palsy (CP) agreed on the definition of CP as follows: CP describes a group of permanent disorders of the development of movement and posture, causing activity limitation that is attributed to nonprogressive disturbances that occurred in the developing fetal or infant brain. The motor disorders of CP are often accompanied by disturbances of sensation, perception, cognition, communication, and behavior, by epilepsy, and by secondary musculoskeletal problems. It is discernible from this definition that children with CP are challenged on a daily basis with motor problems affecting gait. The overbearing motor abnormality in CP is spasticity. Botulinum toxin is useful to control excessive dynamic muscle shortening localized to a few muscles. Many studies have shown reduction in tone and a few have shown improvements in function after intramuscular injection of botulinum toxin Type A. Muscles commonly injected include the gastrocnemius, soleus, hamstrings, and hip adductors in the lower limb. It has been recognized that botulinum toxin is an impressive treatment for spasticity of the lower limbs in CP children and should be combined with physical therapy and orthosis. Improvements in gait and gross motor function have been established with isolated botulinum toxin Type A injections into the gastrocnemius muscle for equinus foot deformity, as well as with multilevel lower limb injection. However, treatment response varies widely, within and among indications and more research is needed to predict optimal response. Its use in CP children is also rare in Indian literature. The purpose of the study was to evaluate the efficacy of botulinum toxin Type A injection in the lower limb spasticity in CP regarding reduction of spasticity and improvement in range of motion (ROM) and gait. The study was conducted in the Department of Physical Medicine and Rehabilitation in a tertiary hospital in North India. It was a prospective, interventional cohort study conducted over a period of 1 ½ years. All the CP children attending the department were screened for inclusion into the study. Referring to the article by Raj et al., the minimum required sample size with 10% margin of error and 5% level of significance is 26 patients. To reduce the margin of error, the total sample size was taken as 31. The CP children were then thoroughly examined and assessed after obtaining complete history and informed consent from parents. Gait parameters (velocity, cadence, stride and step length, toe drag, and base of support) using footprint analysis. In this assessment, the children were instructed to walk at their regular speed across a white paper looking straight ahead after having their feet dipped into a tray of tempera paint [Figure 1]. The entire sequence was timed using a stopwatch. All the enrolled children were evaluated for the different outcome measures just before injection at baseline and at 4 and 12 weeks after injection (0, 4, and 12 weeks). Categorical variables were presented in numbers and percentages (%). Various descriptive statistics, such as mean, median, range, and standard deviation, were used to describe the quantitative variables. Chi-square test was used to assess the difference in the changes of gastrocnemius and hamstring spasticity on MAS and hip adductor spasticity on ATRS. After normality testing of the distributions by Kolmogorov–Smirnov test, Wilcoxon signed-rank test was used to assess the differences in changes of ROM of the ankle and knee, base of support, and different gait parameters. P < 0.05 was considered statistically significant. All analyses were done using SPSS version 21.0 statistical software (IBM Corp., Armonk, NY, USA). Approval from the Institute Ethics Committee was taken before commencing the study. A total of 31 children were enrolled and all of them completed the study. Age of enrolled children ranged from 4 to 14 years with 28 (90.3%) in the age group of 4–9 years and 3 (9.6%) in the age group of 10–14 years. Of the enrolled children, 27 (87.1%) were males. There were 21 (67.7%) diplegics, 3 (9.7%) quadriplegics, 6 (19.4%) right hemiplegics, and 1 (3.2%) left hemiplegic. As per the inclusion criteria, botulinum toxin Type A was injected in 42 (14 bilateral and 14 unilateral) gastrocnemius and 6 (2 bilateral and 2 unilateral) hamstring muscles which had Modified Ashworth Scale ≥2. Statistically significant reduction was seen in spasticity of gastrocnemius and hamstring muscles in the follow-ups at 4 and 12 weeks compared with baseline (P < 0.05) but statistically insignificant at 12 weeks compared to 4 weeks, even though the improvement was noticed in few children [Table 1]. 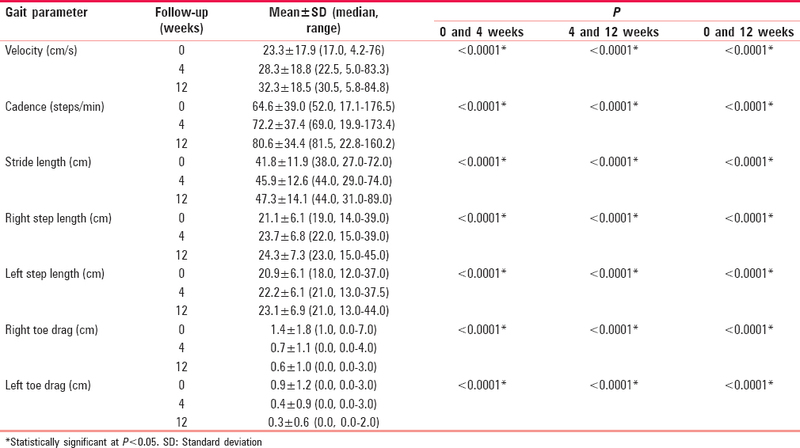 There was also a statistically significant improvement in active ROM at the ankle and knee during the follow-ups at 4 weeks (P < 0.05) and at 12 weeks (P < 0.05) compared with baseline and also at 12 weeks compared with 4 weeks (P < 0.05) [Table 2]. A total of 15 (7 bilateral and 1 unilateral) had Adductor Tone Rating Scale ≥2, and they muscles were injected with botulinum toxin Type A. Statistically significant reduction was seen in adductor spasticity on ATRS in the follow-ups at 4 and 12 weeks compared with baseline (P < 0.05), but statistically insignificant at 12 weeks compared to 4 weeks [Table 3]. Statistically significant improvement in base of support was seen at 4 weeks (P < 0.0001) and at 12 weeks (P < 0.0001) compared with baseline and also at 12 weeks compared with the value at 4 weeks (P = 0.005) [Table 4]. There was a statistically significant increase in velocity, cadence, stride length, and left and right step lengths at 4 weeks (P < 0.0001) and 12 weeks (P < 0.0001) compared with baseline and at 12 weeks compared with 4 weeks (P < 0.0001). Statistically significant reduction was noticed in the right and left toe drag at 4 weeks (P < 0.0001) and at 12 weeks (P < 0.0001) compared with baseline and at 12 weeks compared with 4 weeks (P < 0.0001) [Table 5]. There are various types of CP, of which the majority belongs to the spastic group. Management of spasticity in CP children can be nonpharmacologic (physical therapy, casting, and orthotic use), pharmacologic (oral, intrathecal, and injectable), and surgical treatment options. Botulinum toxin is an extremely potent neuromuscular blocking agent when injected into the area of the motor point. Bipedal gait is immensely adroit and energy efficient for short-distance mobility. Children with CP have poor dynamic gait stability and require more strides to fritter away the disturbances that are present in their walking pattern. In an attempt to stabilize these disturbances, the children with CP appear to utilize a wider step width and modulate their step length. In this study, there was improvement in gastrocnemius spasticity and active ROM of the ankle after botulinum toxin Type A injection. Sutherland et al. found improvement in the dynamic alignment in both stance and swing phases, but no significant change in the passive ankle dorsiflexion after botulinum toxin Type A injection. They had given two times injection 4 weeks apart (placebo or botulinum toxin Type A) but did not mention if the enrolled participants also received any physiotherapy or splintage. The continuation of splints and exercise during our study, as well as use of active ROM instead of passive ROM, might have resulted in the difference in the results. Ubhi et al. also found no significant change in passive ankle dorsiflexion but improved gait after botulinum toxin Type A injection. The lack of effect of botulinum toxin Type A injection on passive movement, but positive effect on foot placement might be possibly because botulinum toxin Type A affects the “dynamic” spastic component contrary to the range of passive movement which encapsulates resistance produced by muscle or joint connective tissue. At the end of this study, the spasticity of hamstring and adductor muscles reduced along with improvement in the base of support. This is comparable with those of Mall et al. In a study on strategies adopted by CP diplegics for increasing walking speed compared with typically developing children, it was found that diplegics were slower and relied largely on cadence to increase speed with less ability to change velocity and stride length. The different gait parameters observed in this study showed improvement after botulinum toxin Type A injection. This study had its own limitations. Change in the gait parameters following botulinum toxin Type A injection to only a single muscle group was taken into consideration. Its cumulative effect on the different gait parameters in the same child receiving injection at multiple muscle groups was not looked at. It had a small sample size and short duration of the study. Studies with a weekly follow-up until a tapering of the effect is noticed would be optimal to ascertain the time when the effect of botulinum toxin Type A on various parameters peaks. Furthermore, follow-ups for longer duration with bigger sample size would be useful in determining the appropriate timing of reinjection. Local injection of botulinum toxin Type A is effective in reducing the spasticity of gastrocnemius, hamstrings, and hip adductors in CP children. It was also associated with improvement in the active ROM at the ankle and knee. Botulinum toxin Type A injection also leads to improvement in the velocity, cadence, stride length, step length, toe drag, and base of support in these group of children. Baxter P, Morris C, Rosenbaum P, Paneth N, Leviton A, Goldstein M, et al. The definition and classification of cerebral palsy. Dev Med Child Neurol 2008;49:1-44. Oleszek J, Davidson L. Cerebral palsy. In: Braddom RL, editor. Physical Medicine and Rehabilitation. 4th ed. Philadelphia: Elsevier; 2011. p. 1235-55. Graham HK, Aoki KR, Autti-Rämö I, Boyd RN, Delgado MR, Gaebler-Spira DJ, et al. Recommendations for the use of botulinum toxin type A in the management of cerebral palsy. Gait Posture 2000;11:67-79. Raj K, Sanjay W, Singh U, Yadav SL. A study of effects of intervention of Botulinum toxin – A on lower limb in children with spastic cerebral palsy. IJPMR 2015;26:94-101. WEMOVE. Management of Spasticity with Botulinum Toxin Type A (Botox), Edition 3.0. In. WEMOVE; 2005. Barnes MP. Management of spasticity. Age Ageing 1998;27:239-45. Kurz MJ, Arpin DJ, Corr B. Differences in the dynamic gait stability of children with cerebral palsy and typically developing children. Gait Posture 2012;36:600-4. Sutherland DH, Kaufman KR, Wyatt MP, Chambers HG, Mubarak SJ. Double-blind study of botulinum A toxin injections into the gastrocnemius muscle in patients with cerebral palsy. Gait Posture 1999;10:1-9. Ubhi T, Bhakta BB, Ives HL, Allgar V, Roussounis SH. Randomised double blind placebo controlled trial of the effect of botulinum toxin on walking in cerebral palsy. Arch Dis Child 2000;83:481-7. Abel MF, Damiano DL. Strategies for increasing walking speed in diplegic cerebral palsy. J Pediatr Orthop 1996;16:753-8.